Sometimes it doesn't take much. You've had a hard day. Nothing seems to be working for you. Then as you head home something random happens to you. It might be just a small act of politeness, your bus driver let's you on late or you see something which just makes you appreciate living ... especially in a place like Perth. 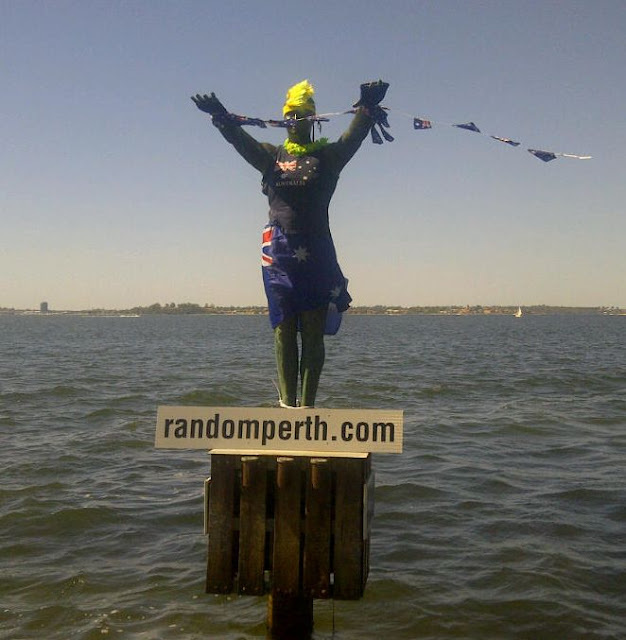 For thousands of Perth motorists it comes when they see Eliza, the Swan River's diving lady statue on the Crawley Foreshore. What she's wearing is completely random. A football club jumper, a graduation t-shirt, a dress for a royal wedding. It's this randomness that shakes things up. It makes life interesting. Perth sits on the edge of the desert and takes pride in being the world's most isolated capital city. We live here, know it's great. But often it's the random moments and things you see which make it so awesome. We want the people of Perth to share their random moments. That's why we've created this site. Anything you see ... which you think is random but special in its own way ... we want to feature. With Eliza as you're inspiration ... it's all up to you. Photos, practical jokes, personal stories ... anything. Send it in. If you have seen anything random happen in Perth that is worth sharing, then email us with your photos and/or video links and we will share them with the people of Perth. great idea for a website. i been wanting to know for ages who dresses up eliza. come on people, who are you?????????? As you round the bend towards Eliza it is with anticipation that the kids in the car look towards her, just what will she be dressed in today? It is random and we love it! Stay tunned for our random acts to be posted here. Sending from Malaysia where the random acts are a little hard to find, we miss Perth and the randomness that makes it what it is.... Brilliant. I love riding along MBR and checking out what's new with Eliza..
Random Perth is exactly what it says, it's about random things happening in Perth, that are worth sharing.